Be the first to share your favorite memory, photo or story of Leticia. This memorial page is dedicated for family, friends and future generations to celebrate the life of their loved one. 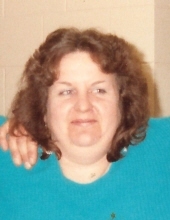 Leticia Ruth Walter, age 57, died peacefully on Monday January 14, 2019 at MidMichigan Medical Center in Alpena. The daughter of James and Donna (Bruder) Chaskey, Leticia was born in Ypsilanti on February 27, 1961. Formerly of Onaway, she has resided in Alpena for the last 10 years. Leticia loved nature and enjoyed rides through the woods. She had a large collection of rocks, all shapes, sizes, and colors, with her favorite being the pudding stone. She enjoyed cooking and gardening. Leticia will be dearly missed. She is survived by her sons, Brian Chaskey of Pinconning and Frank Walter of San Diego, California; daughter, Teresa Chaskey of Michigan; father, Jim Chaskey of Onaway; sister, Rebecca (Kirk) Newsted of Onaway; brothers, James Robert (Virginia) Chaskey of Sunland, California, Rodney (Glenda) Chaskey of St. Clair Shores, Michael Chaskey of Indian River, Leaton (Judy) Stevens, Edwin Stevens, Dale Stevens, and Clay (Jeannie) Stevens, all of Onaway; T.J. (Diane) Baker of Seattle, Washington, and Kurt Westbrook of Tennessee. Leticia was preceded in death by her mother, Donna Bruder-Westbrook, and her step-mother, Joanne Chaskey. Leticia’s family will receive friends at Holy Cross Lutheran Church in Onaway on Saturday February 9, 2019 from 11:00 a.m. until the time of the memorial service at 12 Noon. Pastor Trenton Wollberg will officiate. In lieu of flowers, please consider a contribution in memory of Leticia to her family to help with funeral expenses. To plant a tree in memory of Leticia R. Walter, please visit our Tribute Store. "Email Address" would like to share the life celebration of Leticia R. Walter. Click on the "link" to go to share a favorite memory or leave a condolence message for the family.